Alan, you will be greatly missed. Thanks for enriching my life. #22 is pretty damn sad. Wishing you well in whatever comes next. Siempre esta clase de tragedias son lamentables... vamos, como todas, aunque la naturaleza es la que a destruido todo esto, las autoridades tienen mucha culpa de las muertes, por no analizar las zonas de riesgo. Whenever this kind of tragedies are sad ... We, like all others, although nature is what has destroyed all this, the authorities are much to blame for the deaths, not to analyze the areas of risk. the dog named "Leao" actually belongs to a guy who works at the cemetery and his real name is "John"
It was revealed that #22 is a picture of a random dog, not the deceased's. Alan - thank you VERY much for your great work! Big Picture has become an integral part of my daily visual intake. I'm actually very happy you're moving on. Now we'll have one more great news photo blog! @Alan- you will be missed; thank you for all of your hard work! Amazing photos, my heart goes out to these people. Alan, you've opened my eyes to alot that goes on in the world. Thankyou mate, good luck in your future endevours. Alan ... happy for your new venture, sad that Big Picture will lose your unique perspective. You made this my favorite blog. Please let us all know what you do next. Que Deus abenÃ§oe todas a famÃ­lias! amÃ©m! Pelos que ficaram sem familia. Pelos que ficaram sem nada. Haja forÃ§a e coragem a todos que sofreram com essa tragÃ©dia. Thank you so much Alan. Good luck in your future endeavors, whatever they may be. Alan, thanks so much for TBP. Good luck with your new projects! les pauvres gens, vraiment des images terribles. Alan, you did a really nice job. Thanks, Alan. You've taught me so much about what it means to be human. Blessings to you! Thanks for your hard work Alan and best wishes for the future! I've enjoyed the Big Picture for many years and look forward to it continuing. Alan, you made folks look at the good, bad and ugly. We are better for it. I will be changing my shortcuts to your next venture. Today's photo edit round...sobering. Wow. Alan, thank you so much for all your work with the big picture. I've waited on the edge of my desk chair for your next post, for your next glimpse into a different part of the world or what's going on around us. Left Speechless by those pictures. My prayers go to them. Seems as if the whole world is falling apart. We will miss your work Alan! Whenever it rained a lot this season in Brazil. But it never rained like this before. This was an unpredictability disaster, and many families lost their relatives. Even firefighters trained to this kind of tragedy, were impressed with such destruction. Fortunately many people have survived the floods and landslides. These houses were not considered dangerous areas. The volume of water that came down the slopes exceeded the limit. The forecast also predicts that it will rain more in Rio, and the number of victims continues to grow. It's a pity you have too say good-bye with photos showing such a tragic incident. P.S. : Alan, I follow The Big Picture since it started, and you made a great work here; thank you and good luck. I hope they can hold the high quality standard up! Alan, your Big Picture has brought so much of the world to my computer in a way I don't get from "regular" news sources. I've looked forward to each installment over the last couple of years. Thank you for all your efforts! - and best of luck in whatever you head into next. Alan good luck to you manâ€”you made a HUGE impact with this blog. All the best in whatever you take on next. Alan, thanks for your work on Big Picture- it's been the source of some of my very favorite photos. The story about the dog LeÃ£o is not true. His owner is the gravedigger. And IÂ´m not kidding. Do not there is much to be said, only that it is very sad! We hope a lot of strength to Rio brothers! A Merci Alan from France, your photos have been always great. Merci pour ces magnifiques photos semaine aprÃ¨s semaine, bonne continuation Alan. I'm Brazilian expat it's just so sad to see these pictures. I truly hope that local and federal authorities will provide the financial resources to prevent such tragedies in the future. This is a recurrent issue during the summer monsoon in Brazil. Thanks so much Alan for all your work and good luck in your future endeavours. The scale of the devestation is truly horrifying!! Alan, thanks for consistantly bringing us amazing, thought provoking pictures to wonder at! My condolences to all in Brazil who have lost loved ones. Alan....thank you for all you've done. I always look forward to the Big Picture - it's one of my favorite sites. You will be missed. Your replacement will have big shoes to fill. When I first saw that this was your last posting, I was disappointed that you were finishing your run on such a sobering subject- I now realize that this is what you do best. It would be a lot easier to put up a posting of baby polar bears and balloons in the sunshine, but you never fail to make events in the rest of the world real to me. It's easy to miss the reality what's going on out there, and this blog provides invaluable insight. Alan: Good luck with your new "In Focus" blog at The Atlantic. Boston Globe Editors: You've got some big shoes to fill. Please don't take the easy road and avoid challenging stories like this one. Great and touching photos - as always. Fantastic work. Alan, let me say thank you as well, I have rarely missed out on your fantastic galleries. I hope that your future projects will be just as awesome. I hope your colleagues will do an equally good job... And let us know what you're up to! Alan, please do let us know what you do next. You have truly created something special and inspiring here. Good Luck Alan. This is the best photos site in the internet. OBS: The dog of photo 22 belogs to a cemetery emploee. Thank you Alan for this great work. The Big picture is one of my favorite site. I hope Boston Globe will continue in the same way. Bon vent, Alan, the best for you. Sorry to see you go. Have enjoyed your work on The Big Picture. Best wishes on your future endeavors. Brilliant, but sad pictures of a horrible event. Best wishes to all effected by this disaster. Alan: Thanks for your efforts and your very very good work. I wish you all the best and that your new path will work out for you. Thank you Alan. You made the world a smaller place, and all mankind more responsible. Well done Alan Taylor. I have enjoyed every one of your picture choices since your first great effort and have enticed many many others to enjoy it too. I'm already following the Atlantic tweets and look forward to the RSS feed soon. I'll stick with the Big Picture as well, and it will be interesting to see how it develops without your input. Alan I wish you all the best! Thank you for the wonderful photo-blog! My week wouldn't be the same without it. Oh no! We'll miss your eye for photography Alan. Have fun in your new ventures and thanks for making this such a great blog. ALAN, THANKS FOR SHARE THIS PICS, BEST WISHES IN YOUR NEW JOB, YOU GOT A LOT OF FANS. I've long enjoyed TBP. Thank you, Alan, for your wonderful work. The best to you in your new endeavor! Thank you so much for your work Alan, I looked with anticipation for your next blog. I hope your next venture is an exciting one, take care! iÂ´m brazilian and there are floods every day in Sao paulo the population is tierd. Alan, thanks for giving something for me to look forward to every Monday, Wednesday and Friday for the past couple years. Much appreciated. Good luck with your next adventure. Que tristes imagenes, animo !! hermanos BrasileÃ±os. @ Alan: thank you, your blog has enriched my life. The tears didn't come until #22, then I lost it. How completely devastating, my heart goes out to everyone affected. And Alan, you will be missed here! Good luck in your new venture. Alan, The Big Picture has become something that I check every day. Love the photos each day and sad to hear you are leaving this endeavor. What are you going to be doing next something along the same line, I would love to follow?? The information we have here in Brazil is that the amount of rain in 24 hours exceeded the amount of the full month (January is naturally rainy season in this region). The humidity across the country, an unusual phenomenon, coming from the Amazon region and fell over southeast (in the states of Minas Gerais, Sao Paulo and Rio de Janeiro). 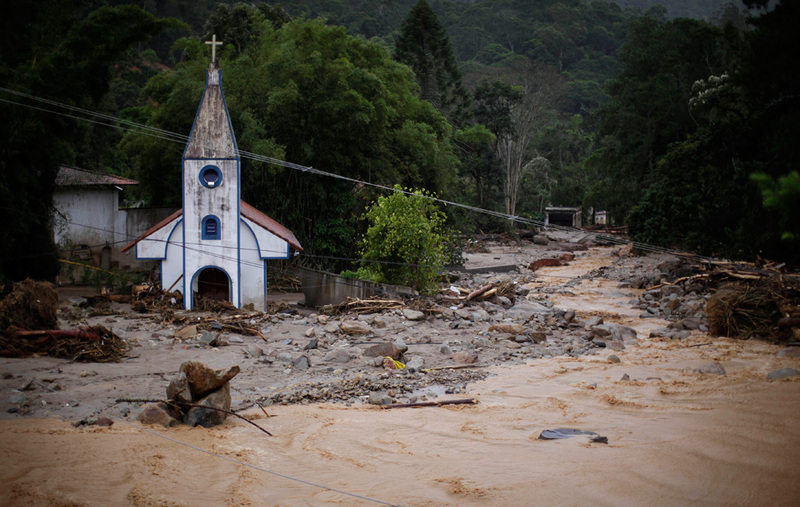 Several cities in the state of Minas Gerais also declared a state of public calamity, with several floods, landslides and deaths. In Nova Friburgo, several trunk water which fell in the higher parts of mountains devastated entire neighborhoods, carrying giant stones to the middle of the streets. Even the rivers changed their courses. The devastation was enormous. Nova Friburgo and PetrÃ³polis cities are very beautiful. The Brazil national football team makes its pre-season in Petropolis. It is very sad to see all this destruction. Those people have 18 stations to prevent this kind of disaster and the govs were discussing who would pay for the maintenance! I guess they are more concerned about the olympics and world cup, right?! I hope that this disaster can open our governament "eyes" and We as a Country starts to prepare ourselves to natural disasters. Thank you Alan, you did great job. La 22 es falsa?,manipulacion del epigrafe?. Amazing photos as always. My thought and prayers are with the people of Brazil. Alan, I wish you the very best. This site has been a part of my routine for a couple of years now. I can't get this depth of information anywhere else in the general media. I hope they keep up your good work. You will be missed! Alan, you will be truly missed. All the best for all your future endeavors. Always amazing photographs. I agree please let us know what you will do next Alan. Lets hope it's something we can all enjoy as much as we do this blog. Also a big thank you Alan - this is a terrific blog and has really helped bring the news back more towards reality. I feel all too often that news sources go after sensationalised headlines, exaggerated scare stories but still censor the true sadness of many events. It's been a breath of fresh air to see news at it's most basic yet most impactful. Dear Alan, I thank you not only for the impressive images, but also for the good choice of topics and for the objective and discreet captions. Bye! Thanks Alan, you created something amazing here. Alan, thank you for your hard work, and making the big picture an internet favorite! Hope everything goes great for whatever is next for you! thank you, alan, for your tremendous efforts here. Thanks a lot Mr.Alan, you made the world closer to us, we will miss you. I was born and raised in Teresopolis and I've never seen anything like this. The storm in that night was really scary. Brazilian people used to think that our country is free from natural disasters like hurricanes, tsunamis and earthquakes. But in that night, the nature proved the opposite. We were not prepared to this kind of disaster. but the best part was seeing the solidarity of our citizens and his dedication to helping others. Carrying and donating supplies, treating the sick people and doing what is possible to see their happiness. Today, I know that I live in a small town, but with great people. God help us in this part of the journey! Thank you Alan! You've done such an amazing job with this blog. It's been a great source of both aesthetics and news for years. Alan, thanks for all your great work! Hope the blog will keep up it's quality in the future. Thank you, Alan, for your interesting work here. Thanks for making my favorite website what it is today, Alan. Best wishes in all you do. @ALAN - All the best. The Big Picture is one of my favorite blog thanks to you. Alan, Tell us what you'll be doing next. I don't think the site will be the same without you. I follow regularly!!! thank you! Many many many thanks Alan for this amazing sharing journey that sadly ends today ! Wish you all the best for the rest of your job trip. Alan, thank you so much. These pictures are life, both joy and sorrow. Have it good, wherever you go next. Thanks for a great and inspiring photographic journey. Best wishes ahead! Alan, i've never written a comment here, but now i think it's time. Thank you very much for you work. It was the first photo website i started following on web and to tell you the truth, you work has inspired me to start on photography more than just an amateur photographer. Good luck with your next job! #27 are mudslides, they are not areas that have suffered a lot of damage from trees being cut off. Mudslides don't only occur where there are houses, they are natural occurrences in hills and 'mountains' where the soil cannot take any more water and just 'slides'. John, thank you for being such a great editor! @ALAN - I love The Big Picture and have to thank you for the amazing posts! Wish you all the best!! Reader of 3 years, first time posting. Thank you very much for showing me a fantastic world through pictures. I have come to expect a very high quality of presentation from this site... it will be very hard to fill your shoes! Good luck! Many thanks for setting this up...a site that gives many a new perspective on the world around us. Great job, good luck for your next endeavours! Lets pray for them. Really sad. Great pictures, my fav is #39. Capture the sadness. ALAN, because of you, i put The Big Picture page on my bookmark. The selection of pictures is very2 good. Anyway, all the best for your future! All the best in your new projects. All the best to you Alan, you've brought 'The Big Picture' to the forefront of contemporary photojournalism. Best photography blog i've ever seen. Thanks, Alan. Thanks for all the photo, Alan. Alan,thanks for all your work...you have painted us a very incredible picture! The Big Picture is one of the greatest photojournalism blogs out there and I've been following it for a very long time. Thanks Alan for all of the great pictures and stories. You will be greatly missed! good luck in your next challenge! Photography brings all the world to my eyes at home. Alan, thank you for sharing your talented editing with me. The Big Picture reminds me of listening to the radio in that I always think I'm the only one in the audiance; that you put all these photos together just for me. To all the people of Brazil: I am saddened by your loss and suffering caused by nature's power. I believe you can get the help you need from each other and the helpers on our earth. Desus escreve certo por linhas tortas, todos os sofrimentos estÃ£o sendo monitorado por ÃŠle! Vamos ter fÃ© e orar! O poder da oraÃ§Ã£o com certeza vai ajudar aos que se foram e aos que ficaram! Que Deus tenha piedade de todos! All these photos show at least one thing: poor people, rich people, small houses, big ones... there's no difference, they are suffering the same way. The people who lives in Brazil are doing whatever is possible to help our brothers in these cities. Thank you for showing this disaster to the world! Amazing job Alan, always loved your selections of both topics and photos. thx Alan, thanks for everything for your impressive work! Good Luck! Gracias Alan! Ha sido increÃ­ble e inspirador. Best wishes! Hungary wishes Brazil lots of Fuerza! My heart is with you, people, though I live quite far. Also, Alan, thank you for the pics. Thank you Alan for the Big Picture! Good luck in your next endeavor! Great work! Sadly we see these picture repeated in our country every summer. Seems that our government is more focused in giving themselves a 62% payrise (that's 130% for the president) then actually working to avoid this kind of recurring "natural disasters". Gracias Alan, desde Bolivia, te envÃ­o mi agradecimiento, ha sido un periodo fascinante, fue un gran trabajo!! Thank you so much, Alan, it's been a real pleasure to follow your Big Picture for those years, refreshing regularly the page as to be sure there wasn't a new amazing serie. Tragic and moving photos. Our prayers go out to Brasil and her families affected by this disaster. Alan, thank you for your vision in building this powerful photo blog that communicates and inspires more than mere words. You've shown me so much! Brilliant photos of a horrendous event. Good luck, Alan, and best wishes. Good luck Alan. Nice work here. Por favor, Alan, nÃ£o nos deixe. Seu trabalho nos dÃ¡ muito alento, mesmo trazendo imagens tÃ£o tristes como essas. we appreciate the volunteer rescuer! I wish God Will soon recover ALL ! Great job, Alan. Thanks for it all. Que o Mestre Jesus envolva a cada um em seu Manto Sagrado! Mr. Taylor, many thanks for your work on The Big Picture. A fine selection of photos, as always, although of a tragic event. Best wishes to you, and the best of luck in all of your future projects. I'm Brazilian and I hope this time Brazil will invest heavily in weather forecasting. We're decades behind de US. I'm sad to see you're leaving Alan. I've been a follower of this blog since nearly the beginning, it's one of the first links I hit every day. I come here to smile, to learn, to be uplifted, and to cry. While the individual photos aren't yours, the selection and arrangement always seemed to work in a way that made the collection greater than the sum of its parts. I have enjoyed the window out into the world that you've given us over the years. Hi my name is Lucas and I live in Brazil, but far of this tragedy..
God please bless my country, and take care of the families there's lost someone. I am Brazilian from Rio de Janeiro, the city, not the mountain region. While some of the deaths could have been prevented by prohibiting construction in those areas, that was not 100% responsible. The intensity of the rain and wind had much to do with it. The government of the states and towns, as well as the federal government in Brasil have never before shown the effectiveness and compassion as they have in their response to this disaster. Do not allow the extremist right wingers in Brasil fool you. never has there been such a response, and it is not all done yet. No brasilian will go hungry or un-sheltered, or without medication and medical care. Of course the generosity of corporations at home and abroad, as well as the people of good will all over the world are also responding with kindness. As a brasilian I thank you with all my heart. long-time reader; thanks for all the work over the years. Thank you Alan! Best of luck with everything! I hope this column will continue to be as great as it was with you in charge! All the best to you Alan. you made big picture really so big. i always admire your fantastic work. we will miss you. If there was a Pulitzer level prize for the work you do, you've earned it. An impressive, inspirational array of photos that leave you breathless, crying, praying and singing all at once. Wow. The earth needs to be respected. What utter power! Thanks so much for all your work Alan. We will miss you! Very sad pictures and I feel sorry for all the people who were affected by this disaster. Is it me or are there more natural disasters happening around the world in the last 5 years? I won't to say that Al Gore is right about climatic changes but I makes you wonders why so many unnecessary death and destruction are happening lately. I wonder what happened to the dog in picture #22? I hope someone adopted her. Dog are really loyal animals. #25, I goes to show you that humans has a good side. Even a rabbit is worth rescuing. I won't be surprise if Brazil rebuilds everything before the end of the year. Unlike Haiti which in my humble opinion is destined to be a basket case. I guess Baby Doc Duvalier wants some of that millions donated to end up in his pocket. All those money donated and nothing to show for it. Thank you Alan you did a big job. You brought the contradictions our common planet into focus, seen from every one. Best wishes ahead! Alan, you had a brilliant idea and have executed it wonderfully over these past however many years. Thank you and good luck in your future endeavors! Thank you, Alan! I have really enjoyed your feature. Best wishes. Many thanks for your great work, Alan! Alan, thank you for so much hard work. Not only have the collections you've put together been fantastic, but it's a treat and a privilege to get to view the actual *big pictures* (990px wide!) that make up The Big Picture, as opposed to most news sites, which generally publish their pics at around 400 to 600px wide. As a serious amateur photographer myself, I appreciate the larger versions so that I can more clearly see and enjoy the detail of each picture. Thanks for everything, and good luck. Alan, you have no clue as to how much your work has been enjoyed and respected. In fact, you have more fans than Lady Gaga!! So happy trails, bud. We will miss your fantastic work, Alan. I'm watching the Big Photo for half of a year now. It is amazing, to see all of the world-class photoreportage photos, i can learn so much from it. Moving photos from the Brazilian tragedy. My thoughts are with them. Thanks Alan and best of luck! I look at 24 and ask myself - Did he lose someone? What will this man do next? Did he owe money for his house that disappeared? This tragedy really puts my worries in perspective. ALAN, AS FOTOS BEM EXECUTADAS, MOSTRAM UMA PEQUENA PARTE DE TODA NOSSA TRAGÃ‰DIA CONSIDERADA A MAIOR DA NATUREZA. NOSSA LUTA Ã‰ ENORME! FELIZMENTE Ã‰ UM POVO SOLIDÃ�RIO. AGORA ENCABEÃ‡O A LUTA PARA SALVAR OS ANIMAS, PRINCIPALMENTE CÃƒES PARA SEREM ADOTADOS PQ PERDERAM SEUS DONOS. OBRIGADO . SOU DE MARICÃ�/RJ. i'm afraid it's bad news for the "readers" of this phblog and i hope it's good news for you - thank you very much mr. Taylor. Fuerza Brasil en este duro momento. Alan, good luck and thanks for your amazing job here. First of all, Alan good luck on your next challanges and congratulations for your great job done here. Big picture you did. Congratulations on the excellent work! You will be missed here in Brazil too. Thank you, Alan! Always enjoyed your blog entries. All the best to you on your new endeavors. Thank you for your amazing work Alan! I wish you all the best! Thank you Alan - amazing work! Alan Thanks a lot for your dedication to this feature, I cannot think of any other resource on the internet or media channels that can so dramatically set the true picture and pain at times of crisis free from the rhetoric or distortion of global politics. Likewise you know how to raise a good smile too when its needed. Hope your now posting is great if your replacements are half as good we will not be loosing out with your loss. Thanks and farewell Alan. This is one of the absolutely best sites on the web. Thanks Alan for your work. You have learned about the world more than us, but thanks for show me how the world is without moving my desk.Remember this.I wish you the best. Thank you Alan for this journey around the globe ; you have done such a great work here. looking forward to what you do at the Atlantic! great work sir! Thanks for all of your amazing work, Alan. Truly an inspiration. Thank you very much Alan for all the interesting, moving, thought-provoking, beautiful entries you have posted. You will be missed a lot! Alan - you have done an amazing job with big picture. Truly thankful for the work you put into it, I think it's one of the best things on the internet. Thanks and looking forward to seeing what else you do in the future, let the big picture viewers know! Good news, Keith Olberman fired! Bad news: Alan is leaving Big Picture. :-( Thank you for all your creative work, and for taking a lot of heat with the praise. Wish you all the best in the future. Thanks, Alan! The Big Picture has always provided a deeper view into the news that I read about weekly as well as the news that I don't really read about in the American media (and lots of fun pictures to boot!). I hope the Globe staff can continue in that vein, to keep a different perspective on the news, and I'm looking forward to your next project. I'm at a loss for words. But hope that those who have suffered can find the strength to rebuild their lives. Thank you, Alan, for providing visual, compassionate world news. I've long appreciated your sharing these photos, particularly since I don't get television news (and it's excessively focused on politics anyway). many thanks Alan, wish you the best! Alan your choices over the years have been very interesting. You've brought the world a lot of stories that would have otherwise remained undiscovered. Hope you find what ever you're moving on to just as rewarding. Lots of success, and happiness for you and those who surround you! Thank you Alan for Boston Big Picture. While it will go on it certainly won't be the same. Your arrangements and editorial eye made the stories sing. Good luck to you in where ever life takes you next! Your work on this site is truly incredible Alan. You will be missed! Alan, you put the 'big' in the Big Picture and now you will be sorely missed. You have inspired thousands of viewers with your selections, and I'm sure you've been an inspiration for others like myself who have discovered a newfound interest in photojournalism. For this, I salute you. Thanks for bringing life to stories around the world, Alan. Good luck in your endeavors. So strong these images! They just show exactly what happened here, in Brazil. Help needed for Rio! I've recommended this site to more people than any other site, and I really appreciate the work that has been done here. Thanks for your contribution, Alan, and I'll be looking forward to your work in The Atlantic as well. We'll miss you, Alan!! God bless you! Thank you Alan, for showing us some many amazing photos, with such a clear professional view. Our world is a bigger world because of you, too. Alan, thanks so much for all the amazing photos over the years. Best of luck in your future endeavours. Praying for the victims of the landslide. Good job Alan and thank you! Thanks for all the hard work compiling the Big Picture Alan, have always enjoyed it. Good luck with your next venture. Alan, thanks for all your work. This one was a great example of what you have been doing all along: bringing the news to life with pictures. I now have a better appreciation for the tragedy of landslides. My sympathies to the victims. Fuerza a todo el pueblo brasilero y a los cariocas especialmente en estos momentos! desde Argentina. Alan, you could not have done a better job. Good luck for the future! Love big pictures, they are excellent! ForÃ§a Brasil, a Venezuela estÃ¡ com vocÃª...! Alan, best wishes for you. Let us know where will be your next assignment. Alan, your work will be sadly missed. You have done such a fantastic job bringing us the world via photography over the years and I am so sad to see you go. Thank you for sharing your talent and the world with us. Best wishes to you wherever you may go. Good luck Alan! It has been great following your work these past years. I live in brazil and here we have been watching this kind of tragedy since 2006. Anyone needs to do something to stop it. Nice pictures as well, but the context is terrible. God bless all the famileis who lost people. Thank you Alan. Your collections help me make sense of this world. All the best wherever you go next. Thank you Alan - and good luck with your next steps. This is my favorite blog and have been following it for years. Pic #5 brought tears to my eyes..
Alan, thanks for all your incredible photojournalistic work! pic.22 hit me the most. Sad to see all this destruction. I Hope these people get the help they need to continue. Hopefuly the Bigpicture quality will continue without you Alan, Good luck for the future. With love from MalmÃ¶, Sweden. that would be the saddest picture of them all!! Thanks Alan for your wonderful work on The Big Picture. Best wishes for what will be next for you. One may say, it's a lack of weather forecasts, it's deadly wrong. People without minimum education don't know anything about geology, build their home where they shoudn't, and pay money to stay there. It's corruption, incompetence and disrespect to environment. Many decades of this. These rains and deaths happens every year, this year were of course more water. As poor the forest becomes the soil gets , the runoff is faster in surface, because water should be assimilated by trees. One tree assimilates at least 70% of water that falls over. Roots make soil absorb water. It's not that nature is angry, it's results of human acts. In order to understand, there is less then 2% of original forest in Rio de Janeiro. Almost every tree you can see in this photos are recomposition, not the actual system. If there is no system (ecological), it's not stable. You can't destroy a System and put "trees" in the same place, and say it's Ok.
An of course, government institutions that should watch where people are building don't really care about. There were and there is lack of shame in leaving people destroy rainforest, and build houses where they could die. So there is government corruption and ignorance that kills. I must thank every one that feels bad about and helps as possible, but we should also understand the Real story behind the facts, make it visible and discuss this problems, in order to avoid deaths next year. Best of luck at The Atlantic! Thanks for the Big Picture. This blog has upped the bar for editorial photos on the net. Thx for so many amazing photos. Great job ! Good luck for your next adventures. As a brazilian, a shiver ran down my spine while I saw this post.. It was terribly sad and we must understand it as another signal of nature. Something is really wrong. photojournalism. Success, brother, anywhere you go. Thank you, Alan. You made this webpage famous all over the world. Excellent job, best wishes and good luck ! Whoever takes your place, Alan, has a very large footprint to fill. I have so enjoyed your choices over the years. Blessings to you for whatever you are tackling next. Best wishes, Alan! Thanks for lots of great entries :) I've been following this blog for a while now, and I really enjoy it! Muchas gracias por compartir estas fotos que son una pequeÃ±a muestra de lo que los cambios en el clima estan y van a afectarnos en los prÃ³ximos aÃ±os debido a la falta de previsiÃ³n. Mi sentido pÃ©same por las vÃ­ctimas de Ã©ste desastre natural. Alan, thank you for making this one of my favorite blogs over your time here- best of luck with everything! Thank you Alan. I have enjoyed your photos, and your skillful editing, very much. May the future bring back to you the richness you have shared with others. Thank you for each and every album you have created for us. I hope, we will be able to follow you at somewhere else soon. Best wishes from Turkey. Amazing pictures that give us a slight idea of what has happened to the people of TeresÃ³polis, Nova Friburgo, PetrÃ³polis, Sumidouro and nearby cities in the state of Rio de Janeiro. What really saddens me is the fact that huge floods and landslides have been happening in Rio de Janeiro, SÃ£o Paulo, Santa Catarina and other Brazilian states every year in the last decades. This was definitely the most powerful natural disaster there has been in our country, with the biggest number of injured, dead and homeless people left after the catastrophe. However, it is not at all surprising to any Brazilian the fact that there were floods and landslides in this area during the month of January, Brazilian summer, when it usually rains a lot in the Brazilian southeast and south. What our government must do is pay more attention to weather forecast and be able to warn the population - as seen elsewhere around the world -, provide them with shelters they could go to BEFORE the disaster takes place, in order to avoid so many losses. It rained much more in Australia than in Brazil this year. Nevertheless, hundreds - maybe thousands - of people died here, while in Australia, around a dozen. This fact shows the lack of investiments of the Brazilian government in weather forecast, housing and preventing disasters. It also depicts the lack of importance and respect the Brazilian population has to their governments. It's time they did something to prevent so many casualties every summer in a state in Brazil due to flooding, landsliding and other rainstorm-related catastrophes. I am Brazilian, from the city of Rio de Janeiro, and luckily my father, stepmother, uncle, aunt and cousins - who live in TeresÃ³polis - went through this episode unharmed, except for the blackout, water shortage and inability to communicate through the phone or cellphones during a week or so. My family was lucky this year, but I can't predict what is going to happen to us next year. What I do know is that some cities in the Brazilian southeast will be once again devastated by the rain in the summer, thousands of people will be left homeless, hundreds will die and others will be severely injured. If I am sure about that, being only 26 years old, I suppose our governors, a lot more experienced than myself, might know about this as well, so why not taking some action in order to avoid such facts and figures? A guy named Jacques mentioned above he believes with all the will power and sympathy Brazilians have been showing lately, he thinks TeresÃ³polis, PetrÃ³polis and Nova Friburgo will be rebuilt within a year. I don't doubt it eather, but within two years, they may need our help again, for the same reason. Or the people from ParanÃ¡, or EspÃ­rito Santo, or Santa Catarina, or any other place in the Brazilian south or southeast. That is extremely frustrating. So bad that the beautiful mountains have caused so much sorrow to the people.. Thank you Alan for your work. Thank you Alan for the exceptional work you have done with this blog! Best wishes for your next chapters! Sir, you will be missed. Thanks for the great insight into the world. Thanks for the fun Alan. Good luck! Thank you Alan, you've done a terrific job. All the best! Dear Alan, thank you for this amazing work. It is one of my favorite websites and as teacher it is one of the best sites to show my students what is going on in the world. All the best for you. Alan, thank you. You did a wonderful job, every single series touched me just before realizing once again, how beautiful Life is. Keep up the great work, Greetings from Germany. Alan, thank You for this fantastic project! Your choice of subjects and photos show a very diverse and rich world we live in! Best of luck on Your future projects! All the best to You! "An effect is what happens as a result of the cause"
I think that Amazon deforestation may be part of the cause of this. Good luck Alan and thanks for everything you did here. Alan, thank you for creating my favorite place on the Internet. In this series number 22 with the little dog was a stunner. Best Wishes as you move along. Thanks for your work, Alan. Your work has always given realistic and amazing insights to the world. as #247 wrote, it is all about forest cropping and short term thinking. If you want to help out, the Boston University Brazilian Association is having a fundraiser. Please contact brasilbu@gmail.com for more information. Thank you Alan, I have been in awe over the selection of images from Big Picture for over two years now and will continue to visit. Thank you for all the great photos! greetings from Sydney, Australia. Thank you so much for all the work you've done in putting these photos together the last few years. I've been following for at least 2 years now, and I can certainly say the adage is true that "a picture is worth 1,000 words". When so many stories have come through the "news pipes", I always try to see what is on The Big Picture, as these pictures are what speaks to my soul and help me to respond emotionally to what is happening in this world, after reading the stories. Thank you, thank you, thank you for making this happen! Best of luck in your next endeavor. Thanks so much Alan. Always a joy to find a new post from you. More than a few will miss you here in California! Best of luck! Un grand MERCI Alan pour ce travail remarquable. Bonne chance Ã vous pour l'avenir. En espÃ©rant que cette ligne Ã©ditoriale reste la mÃªme. its sad, to say the least, but to put blame on people is ignorant. heavy rains, is what caused this mudslides. END OF STORY. A tradgety, I SEND my prayers. The people of BRAZIL are a proud, intelligent and VERY capable people they will prevail!! Thanks so much Alan, I really cannot praise this blog highly enough as an excellent source of news - well rounded and edited to show the humanity and individual stories behind the headline - and often a brilliant showcase of photographic art. I wish the new editor all the very best and hope this blog continues to showcase the the world's finest photojournalism. Thank you for all the amazing pictures, Alan. Alan. You will be missed! The photos you've posted have been a staple of my life for the last few years. Thank you for helping me see the world in a new way. Its amazing works you have given to us, you made us see what is happening to our world. Thanks Alan. And my sympathy and prayers to all Brazilian victims. may God give the courage and the strength to all the Brazilian Brothers and sisters to face this difficult time. Thank you so much for these great pictures that kept us informed. All the best from South Africa. Thanks, Alan! It was incredible. I whish you the best ! Thank you Alan for this extraordinary work! Hey Alan, thanks for giving us such great work. Is it possible for the guys now in charge to tell us where Alan is going to work next? Please, read the comment #247, it says everything people needs to understand about what's happening in Brazil: It is corruption and ignorance. The government shouldn't avoid deaths, it should take care of its citizens' life instead. Thanks for you all who feels sad, and helps as you can. But we must show the world not only our good hearts and strong hands, we must make them hear our voices: it's enough! Do it right, or you will not last longer taking care of my people. Oh, thank you for these amazing photos. They crunch the heart, boggle the mind, keeps us humble, and makes us pray. Without your pictures I would have never seen the devistation. Thank you again. This is one of the best thing I've seen at journalism so far. Congratulations! This has been the best blog ever, Alan I hope they will continue to make it as quailty as you did. Best hopes for you in your next adventure! Thank you Alan, good luck and thank you for keeping us informed of our world! Alan, I'm going to miss much. Ã‰ muito impressionante essa sensaÃ§Ã£o, pois por tantas vezes vi neste mesmo site fotos de outras tragÃ©dias parecidas, mas desta vez esta aconteceu em meu paÃ­s, numa realidade que choca e me emociona. Thanks for your sensitive eye that already is characteristic. God have mercy on us! Good luck with your live Alan. U did a great job here. Thank you, Alan for all the wonderful trip I did with you ! My solidirity to all Brazilian brothers. Thanks for all the great job you have done Alan! Good luck and succes in all your future projects! Alan, thank you so much for your work. This blog is one of the best things the internet has to offer. Good luck for your future! And help for the amazing country Brazil!! EL reportaje estuve excelente. Dificil de mirar, es duro ver la realidad de esa gente en un minimo porcentaje y no poder hacer nada. Alan, Best of Luck! I've never posted before, but wanted to say THANK you for the spectacular assortment of photos over the years. Your replacement has large shoes to fill! Alan. Thank you for your work with the Big Picture. This is the best photo-blog there is because of your hard work and dedication. I wish you the best in the future, and thanks again for all the stunning photographs and journalism. Sorry to see you go Alan. Your work on this blog has been nothing less than spectacular. Moving on?!?! I sure hope The Big Picture continues your hard work. Everything is always so amazingly honest and uncensored. Also, would love to know what some of your future work entails. Do you have a personal blog or something where we can check in on you from time to time? Thank you, Alan! You have done an amazing job! I wish you the best of luck in your new position. You truly touched us, amazed us, and kept us in touch, and provoked thoughts. Thank you and please let us know, at least once on this post, to where and what function you are transitioning. Would love to continue to follow your work. Just want to give you a million thanks for being the managing editor of this photo blog. I don't recall how l stumbled into it a couple of years ago, but it has kept me going back for more. With some really amazing pictures, you can tell a story that is sometimes gut-wrenching, and other times, heart-warming. I hope the Globe Photo Dept can maintain the same high quality job you have done over the years. I wish you and them much luck. Sem palavras para descrever tamanha furia da natureza. Best of luck to you, Alan, on whatever the next chapter is for you. I've loved the collections you've put together as well as your commentary. Cheers! thanks Alan .... it was great time with you here. DonÂ´t forget on Brazil through this. #22 breaks my heart. It's all sad, and my thoughts go out to those who lost their lives, but there is something very heartwrenching and innocent about that dog and its loyalty to sit there for days on end. I hope people rebuild their lives in peace. Que Deus tenha compaixÃ£o e coforte o coraÃ§Ã£o dessas pessoas que tanto estÃ£o sofrendo com perda de vidas e materiais com essa tragÃ©dia no Rio de Janeiro!!!! Thanks very much for an amazing blog. Your wide ranging collection of photos has brought in a gradually wider audience discovering week after week the plights and joys of others, and in the process making us all seem closer. This is a community like no other, a truly unique place on the internet. With all the respect I say you are the one deadly wrong about that. Itâ€™s a shame, but who knows how many lives would have been spared if we had a good weather forecasting system? And Iâ€™m not talking about cutting edge technology here. Just a good one. Unfortunately ours is lagging behind the rest of the world. You probably donâ€™t know that. By the way Iâ€™m Brazilian too, from Minas Gerais. .I KNOW THE THREE CITIES WELL.MY WIFEÂ´s FAMILY IS FROM NOVA FRIBURGO.COLONIZED MAINLY BY SWISS PEOPLE ,WITH MANY TYPOGRAPHIES AND MANY LADIES CLOTHING MANUFACTORIES.BEAUTIFUL HOMES WIDE STREETS AND A CONSIDERED HIGH LEVEL LIVING ECONOMY.---TEREZOPOLIS,BESIDES ITS BEAUTIFUL LANDSCAPE ISKNOWN FOR ITS CLOTHING PRODUCTION, CAKES ,COOKIES AND MEDICAL SCHOOL.LARGE HOMES ,WELL KNOWN FRUIT AND VEGETABLES.---PETOPOLIS IS CALLED THE IMPERIAL CITY.THE EMPEROR LIVED MOST OF HIS LIFE AND HIS PALACE IS THE IMPERIAL PALACE MUSEUM OF BRAZIL.LARGE CLOTHING COMMERCE AND TISSUE INDUSTRIES.MAGNIFICENT RESIDENCES, AND DUE TOITS PROXIMITY TO RIO DE JANEIRO MANY PEOPLE COMMUTE BETWEEN PETROPOLIS AND RIO .I AM ONE OF THEESE!._DEAR FRIEDS, WEARE SUFFERING FOR THE LARGE LOSS OF HOMES AND ENORMOUS LOSS OF PEOPLE,(CALLED BROTHERS BY US ).WE KNOW WE WILL NEVER RECUPERATE OUR BROTHERS, HOWEVER WITH TE HELP OF PEOPLE SINCERE POSITIONING OF GOVERNORS AND PRICIPALLY THE PROTECTON OFGOD AND OUR LADY OF APARECIDA PROTECTOR OF BRAZIL THATWILL BE GIVING FORCES TO REBUILT WHAT WAS LOST IN THE THREE IMPORTANT CITIES OR THE STATE OF RIO DE JANEIRO.URL. Farewell Alan! We'll miss u.
Als je ziet wat natuurgeweld kan aanrichten vraag je je af waarom is er nog steeds oorlog in deze wereld. Mogen deze mensen de kracht vinden om dit een plaats in hun leven te geven. Heel veel sterkte! Thank you for your wonderful work . Good luck and thanks for everything you did here. Ironically, the sign over the door in photo #30 reads "Here lives a warrior.". To that warrior: wherever you are, I wish you the best of luck on your battles ahead. SÃ£o verdadeiros assassinos em potÃªncial!. O Brasil estÃ¡ marcado pelo luto, conseqÃ¼ente da indiferenÃ§a de nossos polÃ­ticos corruptos. Alan, thanks for your blog, I'm a regular visitor, all the best in your new projects. We will miss you. My best wishes to the people of Brasil, from Argentina, this was a very sad tragedy, but we have to stay strong for a better future in South America. Alan! Keep in touch and make us amaze as ever! Good luck at your new journey, you gave us a great space to see the world. I hope to have notices from you!! That is one lucky home owner in picture 28! Sorry to see you go Alan. The photos were absolutely unbelievable. The destruction has been made very clear to me with your wonderful photos of what has happened in Brazil. This is terrible. I live next to Nova Friburgo.... Unbelieveble!!! them in 1996. Such lush nature everywhere will always be in my mind and now I see what has happened after this disaster I am very sad for all those poor people. I wish that all inhabitants there are comforted somehow for all their sufferings. May they be spared of any future disasters of this kind! I am very fortunate to live in Switzerland and count my blessings every day. I have a good friend who would like to adopt the dog in slide #22. Can you help us locate the dog? A tristeza que sinto Ã© tamanha que nÃ£o consigo comentar! Obrigada Alan por seu trabalho. Leuce Maria Pessoa Raposo - Cidade do RJ. I am very sad , let together praying so the God will give you better . We all of Indonesian people hope the accident will stop soon . Wow...no. 8 and no. 22 are so incredibly sad. But I guess they're all sad though... have to admit that 25 was kind of humorous! Thank you, Alan! Thank you, Boston Globe! You give us the world. Big Picture is a reference of photojournalism. I'm a photoreporter at BrasÃ­lia, Brazil, and I recommend to every one who like photos. Congratulations for your Big Work. Grande trabalhooo dos fotÃ³grafos tambem. LAMENTÃ�VEL A TRAGÃ‰DIA DE NOVA FRIBURGO. NUNCA PENSEI EM VER AQUELAS HORRÃ�VEIS IMAGENS , QUE APAVORARAM TODOS OS BRASILEIROS. UMA CIDADE TÃƒO LINDA, ONDE NOSSO IMPERADOR RESIDIU, NÃƒO MERECIA TAMANHA DESTRUIÃ‡ÃƒO E PERDER TANTOS HABITANTES. DEU PARA CHORAR MUITO. QUE DEUS RECEBA COM MUITO AMOR, TODOS OS QUE PARTIRAM, Ã‰ O MEU GRANDE DESEJO. Thank you Alan, i hope big picture remains as it is. God bless you. Ich bin erschÃ¼ttert, auch ohne Ihre Sprache zu verstehen! Existem regulamentos rÃ­gidos que regem as construÃ§Ãµes perto de encostas e de rios, enfim, de Ã¡reas de risco. HÃ¡ todo um ritual burocrÃ¡tico para permitir-se construÃ§Ãµes, nÃ£o sÃ³ em Ã¡reas de risco, como em qualquer lugar. HÃ¡ que ter-se PERMISSÃƒO DAS AUTORIDADES para qualquer tipo de construÃ§Ã£o. SerÃ¡ que havia estas autorizaÃ§Ãµes? SerÃ¡ que os governos nÃ£o deveriam ter proibido as construÃ§Ãµes? De quem serÃ¡ a CULPA? Strong images. Bad facts. Repeated scenes every year, some worse than others. What can I do? Pray is a good start. Donate is a great choice. See cruz vermelha in Brazil or donate to FAMPE (federation of neighborhoods associations of Petropolis). Be active. Alan Taylor- such a great job you have done on this blog!! Heard you will now be going to TheAtlantic.com and hosting your own blog there!! What fantastic news! 30 - "Aqui mora um guerreiro"
Thank you so much for posting these photos. I am a Brazilian native living in London and not being home at such delicate time is very difficult. Thankfully I didn't lose any relatives at the tragedy but I really wish I was there to help. I'm glad these photos bring awareness to the dimension of such catastrophe even though looking at them can be quite disturbing. May all the victims rest in peace and God bless their families. A foto com a Ludmila de Moura Ã© realmente impactante, nos arrepia e emociona, imaginar o que estava passando na cabecinha dela naquela momento Ã© impossÃ­vel! My prayers and heart go out to them,and the same time I'm humbuly very greatfull for my Spiritual connection & protection.I pray for their serenity& peace in their heart.I wish I was there to help. Merci Alan pour ce travail fantastique et toutes ces Ã©motions ! Alan, thanks for the incredible work and farewell! Oh my God !! The situation is so terrific. I live in Nova Friburgo. My city was devasted !!!! But we are turn over !!!! Mas, de todas as fotos postadas, durante a tragÃ©dia, sem dÃºvida, Alan voce captou maravilhosamente a tragÃ©dia, sem apelar para um fotojornalismo barato. ParabÃ©ns! Never wrote a comment on this blog ever , even though i am a regular visitor. it was a great journey. Thank you very much. Hermanos de Brasil, que dios los proteja y les permita poco a poco reconstruir sus hogares y ciudades. Gracias a estas impresionantes imÃ¡genes pudimos observar lo duro y cruel de la situaciÃ³n. Tengan paciencia, fortaleza y empuje... despuÃ©s de cada tormenta siempre saldrÃ¡ el sol... y ustedes saldrÃ¡n adelante. Afectuosamente desde Punto Fijo - Venezuela. Obrigado por toda a ajuda humanitÃ¡ria q invadiu nossa cidade como uma onda de amor. obrigado aos que tiveram coragem para atuar e vivenciar, estes momentos tÃ£o terrÃ­veis para as famÃ­lias. obrigado, Deus nosso, pelas vidas poupadas por tua misericÃ³rdia. obrigado por tudo... sÃ³ tu sabes o porque de todas as coisas. #8 really breaks my heart. Thanks for your effort on this Blog. I am Brazilian, living in Ireland there are 2 years, i were in Morocco on my holidays when it all happened! I heard about the floods and how bad but just now i could realize how incredible worst it was. Im in total state of shock! Brazil like everywhere else is not out of any catastrophe, as we brazilian keep saying that we are a blessed land. What a mess jesus! I feel deeply sorry for those poor people who haven't no one to look after them. Corruption is who runs the country. Very, very sad! E cade os governantes que sÃ³ pensam em encher seus bolsos. Quando serÃ¡ que aprenderemos a votar. Origado Alan por nos proporcionar a real dimensÃ£o da tragedia com as suas fotos. Como nos proteger? Onde estÃ¡ o erro? Ou onde estÃ£o os erros? Essa sÃ£o as perguntas que precisamos responder, divulgar e executar. Foi duro ver essas fotos, mas necessÃ¡rio. Sr. Alan: numa das primeiras fotos vÃªem-se as pedras cÃ´nicas, desnudas, lisas, sobresaindo Ã s terras verdes! Essas terras verdes, nos vales, ESTÃƒO DESCENDO DAS ROCHAS, hÃ¡ milÃªnios. como agora ocorreu ! E vÃ£o continuar descendo, de vez em quando, fazendo as rochas nuas parecerem maiores cada vez ! Faltou conhecimento de Geologia todos esses 100 e tantos anos de ocupaÃ§Ã£o descontolada das terras verdes ! Vai continuar havendo descida de terreno, agora aderido Ã s rochas, atÃ© nivelar tudo ! Ã‰ sÃ³ esperar mais umas chuvas. Ary Lopes Ferreira. #22 made me cry like a baby! Sou representante comercial , trabalho com medicamentos da linha farma , trabalho na regiÃ£o serrana muitos anos e nunca imaginei uma situaÃ§Ã£o como esta...atÃ© hoje nÃ£o tive coragem de entrar em contato com amigos que deixei por lÃ¡...nÃ£o Ã© covardia de minha parte...Ã‰ MEDO de nÃ£o encontrÃ¡-los . Tem treis anos que estou afastado dessa regiÃ£o mas sinto muitÃ­ssimo e me emociono cada vez que comentamos o acontecido. Que Deus AbenÃ§oe a todos. sÃ£o nessas horas de limite que reunimos forÃ§a no sofrimento e nos superamos. Somos em sua maioria um povo FORTE , SOLIDÃ�RIO e que nÃ£o foge a luta. Que Deus os abrace em especial ( todos aqueles que de alguma maneira ajudaram. People swimming and dying on the mud and you giving cheers to this Allan. hey thanks for this real show , this photo make very one sad god help him ..
Boa sorte , que DEUS lhe de sempre forÃ§a e sabedoria para continuar este arduo e necessÃ¡rio trabalho. Ã‰ muito importante nestes momentos de dor e sofrimento, o apoio e carinho, o braÃ§o amigo da solidariedade. O sentimento maior que encontra-se dentro de todos nÃ³s: AMOR. Meus parabens Ã todos que colaboraram de alguma forma. Que Deus abenÃ§oe a todos e console grandemente o coraÃ§Ã£o dos que ficaram, mas tambem dos que se foram. will bless u and the victims. let us do what we can do and god will do the rest thank u, Im livig in Solomon island. I think we should pray for Brazil people those are in big trouble still now. God help them........ ! Spend a moment of silence and pray 4 d lost llves in the brazil earth quake, may their souls rest in peace.